Location: Situated NE of Bwlchmawr, some 100 m N of A487, on N side of lane to Brynhenllan. 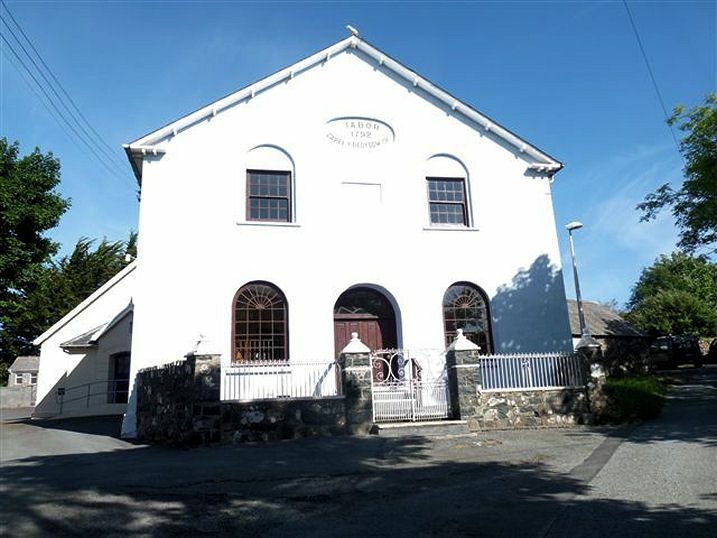 Baptist Chapel first built 1792, rebuilt 1842 and renewed 1882. Gable fronted, rendered with slate roof, bracketed eaves and open pedimental gable. Over recessed plaque on gable ‘Tabor 1792 Capel-y-Bedyddwyr’.Two, first-floor renewed stained wood 15-pane first floor sashes with blank arches above. Centre plaque: ‘Tabor WG Adeiladwyd 1792, WG Helaethwyd 1815, JH/TE MACPELA 1834, LL Ailadeiladwyd 1843, JWM Adnewyddyd 1882’. Ground floor arched small-paned window each side of arched door, C20 stained-wood fixed windows with radiating bars, similar fanlight wit marginal glazing bars over C20 double doors. Two-storey, 2-window stucco W side with horned 16-pane windows and cambered heads. NW 1921 vestry addition by J Teifion Williams of Cardigan. Rubble stone rear with big arched centre light and sashes each floor each side, 20-pane above, 16-pane to ground floor left, then outbuilding at right angles and 20-pane window to right. Outbuilding is long, rubble stone with asbestos roof and C20 board front opening. Front forecourt has later C19 railings with green dolerite piers and double wrought iron gates. Fine interior with curved-angle gallery on 3 x 3 slim marbled wood columns. Marbled cornice under panelled gallery front, the gallery end canted in towards the pulpit. Grained woodwork to pews and plain great seat. Entrance lobby with 3 arched windows and coloured glass. Stairs in angles. Later C19 pulpit with cast-iron balusters. Arched window behind has large lat4e C19 or early C20 stained glass window of Good Shepherd. Flat ceiling with ornate centre domed rose in acanthus ring. A good chapel interior, probably mostly of 1842, the ceiling rose similar to work at Bethania, Cardigan, of 1846-7 where the plasterer was T Rees of Fishguard. Situated immediately on raod opposite Glan Hotel.